What will you do if you own billion dollar investment portfolio with uncertainty of Greece election ? As expected today was a bullish day because of ECB operation and this trend is likely to continue till tomorrow morning. The trend will change to bearish, if ECB does not cut the rate, and this market will sell off. Fed Chairman will testify on Thursday and there will be expectation of QE3. Its just 2 week before the result of Greece election will be out. So if you own a billion dollar investment portfolio, will you take out your money till clarity or will you increase your position thinking market has bottomed or will you risk your money ? Hedge fund manager or any big institution will not take risk. There are so many unknown factor and things could get worse from next week. So its better to be on sideline till Greece election result are out. No doubt there is heavy short position, and market could rally very quickly on good news. So just becareful with your investment. 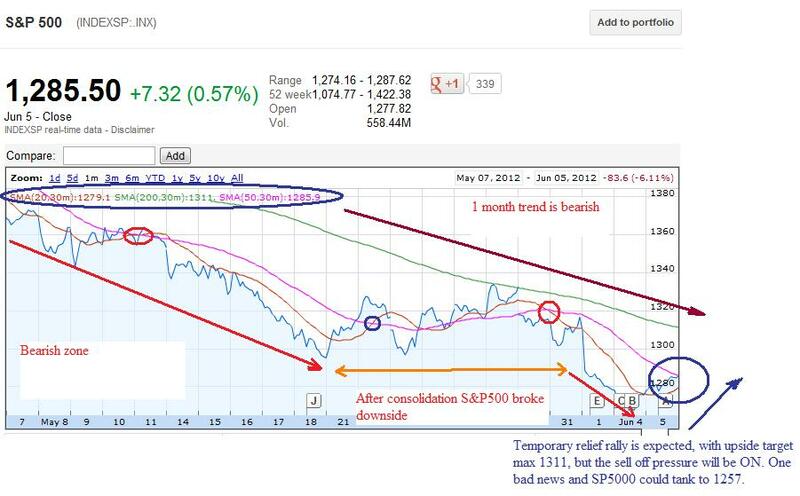 For Bullish sentiment to continue: Dow needs to break 12143, followed by 12225, while S&P500 needs to break 1288. For Bearish sentiment to continue: Dow needs to break 12058, followed by 12000, while S&P500 needs to break 1278 followed by 1274. Premarket Gainer: It will be updated before market opens. Premarket loser:It will be updated before market opens. ECB Announcement 7:45 AM ET *** Rate cut is not expected but 0.25% rate cut could bring big rally, no rate cut could lead to sell off. Productivity and Costs 8:30 AM ET (-0.8% non farm productivity is expected, prev month was -0.5%; higher is bullish sign lower will be bearish sign for stock market). EIA Petroleum Status Report 10:30 AM ET (Built up in inventory is bearish sign, while decline in inventory is bullish sign for ERX, XOM, CVX, HAL). Beige Book 2:00 PM ET (If the Beige Book portrays an overheating economy or inflationary pressures, the Fed may be more inclined to raise interest rates in order to moderate the economic pace. Conversely, if the Beige Book portrays economic difficulties or recessionary conditions, the Fed may see the need to lower interest rates in order to stimulate activity.) Watchout movement in GLD, AGQ.